This recipe is so easy and the presentation is SO much fun!! Be sure to watch my YouTube video tutorial to learn how to make these yummy Pumpkin Cake Pops and also learn some of my tips when it come to grain-free and low-carb baking! Enjoy. Nut butter options: I prefer cashew butter or almond butter (THIS kind has no added sugar or salt). YES, you can definitely make your own almond butter or cashew butter but I did not. Sweetener Options: I used 99% Stevia Select and and additional 1 tablespoon honey (from our bees) but you could also use any sugar substitute or even coconut sugar. The key is to taste BEFORE you bake so that the sweetness can be adjusted. If using sugar or sugar equivalent, use 1/2 cup measurement. You may also have to cook a few additional minutes. Pumpkin alternative: These are pumpkin but you can also use mashed sweet potatoes, banana or unsweetened applesauce. White chocolate Option: These would be AWESOME dipped in white chocolate. Be sure to watch my video for more tips and tricks as well has helpful tips for grain-free baking. Preheat oven to 335 degrees F.
In a medium bowl, combine all ingredients EXCEPT the chocolate. Blend well and taste for sweetness. Lube the top and bottom of your cake pop pan. Using a 2 tablespoon measurement, fill wells with cake batter (I used THIS 1 TBSP scoop and used 2 scoops per hole). Should be enough batter for 13-14 pops. Bake for about 15 minutes. Carefully remove top of pan and remove cake pops to cooling rack and cool complete. Temper chocolate in 2 batches so that chocolate doesn't harden before you finish dipping all the cake pops. Melt 3 oz of chocolate chips in microwave (or double broiler) 30 seconds at a time and stir well after each 30 seconds. Once chocolate is ALMOST completely melted, stir in last 1 ounce of chocolate. Keep stirring until chocolate completely melts. Use popsicle stick or special cap pop sticks in cake pop, cover cake pop in chocolate using a spoon, being careful that cake pop doesn't fall off of stick. Cover cake completely with chocolate. Either cool on parchment paper or use craft styrofoam (like THESE but PLEASE get them for $1 at dollar store, not Amazon, you will need about 3) and stick the sticks in the foam to allow to dry and the chocolate to harden. Once hardened, place cake pops in clear treat bags (get them from $1 store) and create bouquet (see video). Made these tonight! Delicious and soft like real cake with a great crumb! Used a mini donut pan and it made about 24 (probably could have made more since I overfilled slightly). 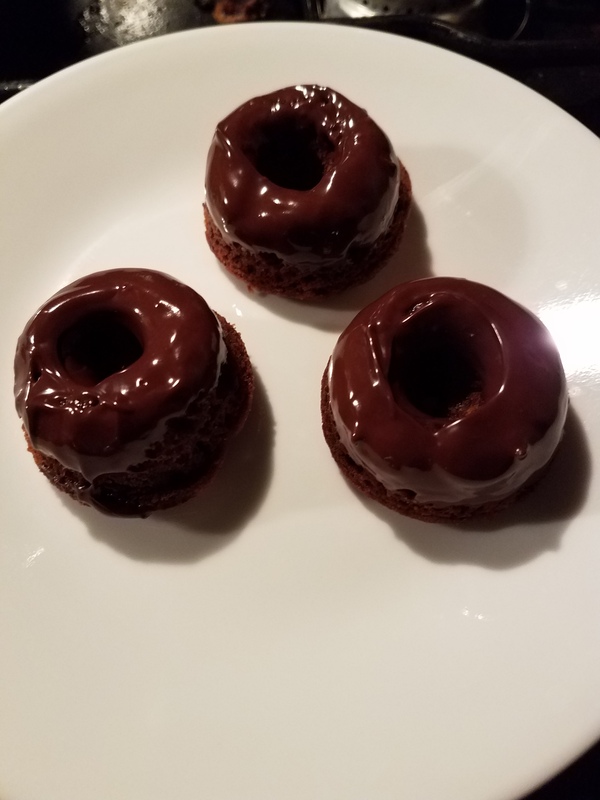 I used 2 TBS of granulated Pyure brand stevia/erythritol blend they have for baking since it doesn’t leave a bitter taste. Dipped in enjoy life chips and they are great with or without the chocolate! Always enjoy your videos and refer to your cookbooks frequently. Thanks for another great treat and all your hard work!